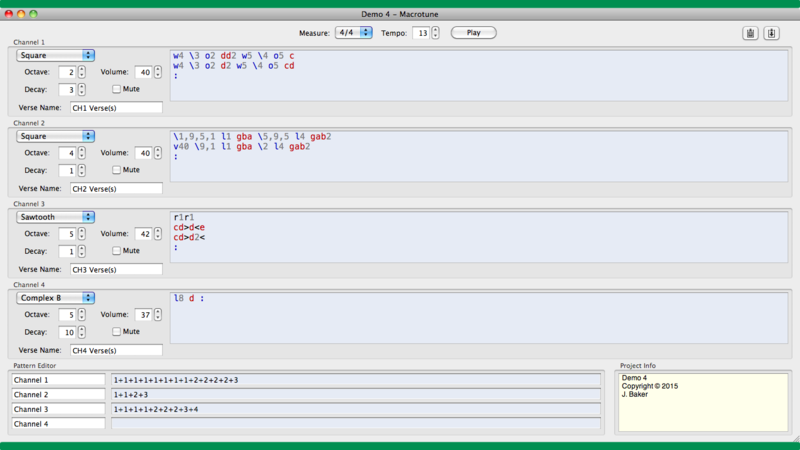 Macrotune is a Music Macro Language (MML) editor. Easily create "retro" style music for an app, game or just for fun! Six waveforms: Triangle, Sawtooth, Complex A, Complex B, Square and Noise. 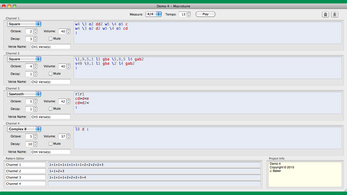 Four MML editors with syntax coloring for each channel. Each channel has its own start/default options. These settings can be altered throughout your tune/song with the Music Macro Language. A time signature bar that allows you to visually see the current beats per measure in the editors while you type. Volume envelopes with or without interpolation. Copy your MML data to the clipboard for use in PureBasic with the PSG Module code. Share your tune/song via the internet, such as forums or email, using "Copy MML" and "Paste MML". A project info box for the author's name, song title, copyright or even project notes for yourself. Intel 32 or 64-bit processor. Intel Pentium III or better (requires SSE). I'd really rather not throw this in the comments section, but I couldn't find any other contact information (Forums has registrations disabled, Twitter has DM disabled, itch.io doesn't really have any pm system I know of...), so posting here since it is probably the most relevant place I can post (since it has to do with MML). Do you take commissions for making programs and add-ons? That would depend on what you are wanting. I'm currently working on something else right now but I may be able to find some time. What are you wanting? Macrotune for 64 Bit Windows (The current version keeps freezing on my Win10 computer). 1.) Hmm. Not sure why it is freezing but I will look into compiling a 64 bit version. 2.) I'm not sure what programming language or game making app you're using but are you able to call on the DLL I've provided? It's available for download too. I hate do admit it, but I don't really know how to call on a DLL. >.< I don't really understand DLLs, UIs, Visuals, or Sounds in general since I don't get the numbers associated with them. I am still learning what numbers go with what colors, what numbers go with what visual elements, and so on. I'm not sure what you mean by note identifier tool? Thanks for sharing your MMLP! Very nice! You can always share your MML project on the forum too, using the copy and paste buttons in Macrotune.